To get something of value, you have to give up something of value. It’s an old adage when it comes to making trades in the NHL and it almost always proves true. 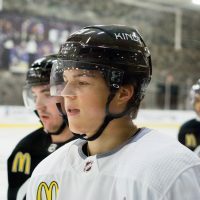 Perhaps, not as often in the salary cap era – when more and more teams seem to be making ‘cap trades’ instead of ‘hockey trades’ (see Marco Sturm) – but, it certainly was true in the summer of 2006. 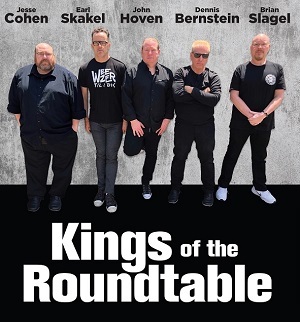 Shorty after Dean Lombardi arrived as the new GM of the Kings he started tweaking the roster, with one of his stated goals being to build his reserve list (i.e. add young players). In a trade that shocked some of the fan base he shipped popular Eric Belanger and young defenseman Tim Gleason to Carolina for Oleg Tverdovsky and an unknown blueliner named Jack Johnson. Sure, in the years to come, many in the hockey world would come to sing the praises of Johnson. However, at the time, he was a college defenseman who had been drafted by the Hurricanes – hardly things that put you on the national hockey radar. 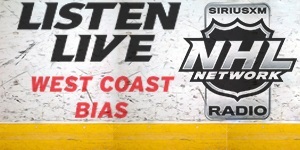 MM: Dave Tippett, your coach in Phoenix, was somebody you knew from your time in LA – how is he different now than he was as an assistant with the Kings? EB: As an assistant coach it’s a different role. I remember being young back then and he was always there for me with good advice. I had a good relationship with him and that was one of the main factors to come here when the deal fell through with Washington. He’s just a player’s coach. That’s what you want. 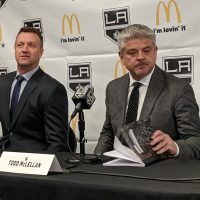 MM: Former teammates Luc Robitaille and Ian Laperriere speak so highly of you – can you talk for just a moment about what those two have meant to your career? EB: Lappy was like a big brother when I came to LA. I lived at his house and he took me under his wing my first year. I learned a lot and I’ve tried to carry that forward with other guys when I’ve had the opportunity. Luc has been the same. He’s a guy who I watched growing up and he’s just been a role model for me. Those two guys have had a big impact on my career and now I’m happy to call those two guys friends. It doesn’t happen that much in this business, so it’s great to have those two guys as friends. MM: Size up the game for us tonight – the two teams have met once so far this season, with the Coyotes winning 4-3 and you had 2 assists. What are the keys to the game for the Kings and the Coyotes? EB: I watched a little of the (Kings) game in San Jose. They’re a young team that’s playing with a lot of confidence right now. Just looking at the standings, every game is a must win. It’s been like that for almost the whole year. We’re out of the playoffs right now. We played the Ducks last night and they’re coming in rested. So, we have to be ready to play our best, especially because it’s a division game and those points are huge right now. MM: Going back to your time with the Kings, what’s your favorite memory? EB: The first team you play for in the NHL is always special. Being drafted and playing my first game on a line with Luc and Ziggy Palffy was a big highlight. I think I had a goal and two assists. Scoring that overtime goal and being part of the playoffs my first year was pretty amazing too. I have a lot of great memories and made a lot of great friends in LA and it’s always going to be a special place for me. 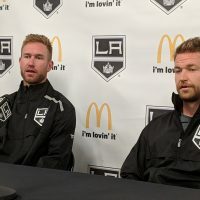 MM: Along those lines, you’ve been traded a few times and then went through free agency last summer, was there ever a point where you thought maybe you were coming back to the Kings? EB: Not really. You look at their team now and they have a lot of money invested in centers. I always felt that when I was traded it was a good trade for them. But, I always wished I could have stayed there my whole career. It doesn’t happen much these days. But, you never know. I still have some good years ahead of me and you never know what the future can hold. MM: In a playoff game with the Capitals last year the cameras caught you removing a tooth. Did you realize that would become such a national story? EB: No. I didn’t do it for the cameras or for anything else. There just happened to be a camera looking at me while I did it. It was just one of those things in the heat of the moment where I wanted to get back and help my team win. It’s ended up being a good thing for me I guess. EB: Oh boy…I have to say a 3-2 win for us. Hope I’m right (he laughs). We’ll know in a couple of hours. 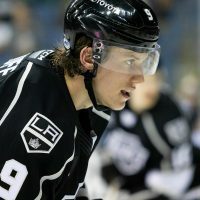 Tonight at 6pm PST in Phoenix the Kings will try to continue their recent hot streak, going for their fifth win a row. It won’t come easy though. As Belanger noted above, it should be a tight divisional game. The Coyotes already defeated them once this year (4-2 back in October) and the Kings have historically had trouble with goalie Ilya Bryzgalov (lifetime record of 12-4-0-2 vs LA, including 2-1-1 last season). On the flip side, LA has gone 9-2-1 in the month of December and are arguably playing some of their best hockey of the season over the last two weeks. Can they keep it rolling or will Belanger’s prediction hold true?